Bexhill United Football Club scored a contentious added time equaliser to salvage a point from its first game on home soil this season. 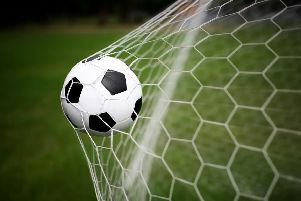 Craig Ottley’s 93rd minute penalty earned the Pirates a 3-3 draw at home to Selsey in Southern Combination League Division One on Saturday as they battled back well from 2-0 and 3-1 behind. Jack McLean and Craig Ottley converge on a Selsey opponent. In contrast to almost all of their previous matches this season, Bexhill started slowly. Home goalkeeper Dan Rose saved well from Remi Coates and Tom Atkinson shot wide from an inviting position before Selsey struck twice in two minutes. Dan Bassil headed the ninth minute opener after Callum Dowdell held off Kyle Holden and delivered an inch-perfect cross. Coates then seized on a loose pass from Sammy Bunn and drove forward before rolling the ball into the bottom corner. Bexhill were quick to pull one back. Selsey goalkeeper Lee Newell spilled a hanging 13th minute cross from the home right and Jack McLean forced the ball home from close range. Both sides might have added to their tally during the remainder of a lively first half on a sunny afternoon at The Polegrove. Jamie Bunn tussles for possession during the 3-3 draw at The Polegrove. For Selsey, a Bradley Higgins-Pearce header when completely unmarked at the far post from a corner was nodded off the line by Ottley and Ryan Morey later drove into the side-netting. At the other end, McLean’s well-struck shot following an Ottley corner deflected into the side-netting and from the resulting Jack Shonk corner, Bunn’s angled shot was held by Newell. Giles had a terrific left-footed shot saved by Newell to his left, while McLean saw an effort blocked and another attempt went just wide. Into the second half and Selsey almost went 3-1 up when Tom Kelly’s low shot following a free kick from the away left clipped the outside of the post. The visitors did restore their two-goal cushion in the 59th minute. Selsey cleared their lines following a Bexhill attack and the ball bounced over the head of Bexhill defender Connor Robertson just inside his own half, allowing Dowdell to run through and slot past Rose. Bexhill made a double substitution shortly afterwards, bringing on Drew Greenall and Georges Gouet, and went fairly direct up to the tall figure of Greenall, who caused problems for the Selsey defence. Holden pulled a shot wide before Bexhill made it 3-2 in the 71st minute, Greenall heading home a Bunn corner at the neat post. With both sides showing total commitment, Bexhill pushed hard for an equaliser, albeit without creating a great deal, even with Selsey giving away a lot of free kicks. Greenall had one shot comfortably saved and a deflected effort went just wide. Bexhill’s persistence paid off in added time. McLean tried to work space in a crowded box and poked the ball forwards, hitting the arm of a Selsey defender at close range. Much to Selsey’s displeasure, the referee pointed to the spot and the reliable Ottley sent Newell the wrong way for Bexhill’s 30th league goal already this season - the most of any team in the division. Bexhill: Rose, Lopez, Ottley, McFarlane, Robertson, Holden, Shonk (Gouet 64), J. Bunn, Giles (Greenall 64), S. Bunn, McLean. Subs not used: Harley, Foster, Rea. Southern Combination League Division One top half standings (all played 8 matches): 1 AFC Varndeanians 22pts (+18 goal difference), 2 Alfold 19 (+14), 3 Steyning Town 18 (+9), 4 BEXHILL UNITED 16 (+21), 5 Hailsham Town 15 (+13), 6 Wick 15 (+1), 7 Littlehampton Town 12 (-3), 8 Selsey 12 (0), 9 Littlehampton Town 12 (-3).